Shoreline Records Management provides paper scanning services for businesses of all sizes, and we specialize in converting Paper Records by scanning them in to digital images for fast, easy access and retrieval. Do you have a Ton of Paper Documents to scan? Don't have the manpower to keep up with your daily paper scanning requirements? Not a problem! Our high-volume scanning services will help capture all of your paper and turn it into images. 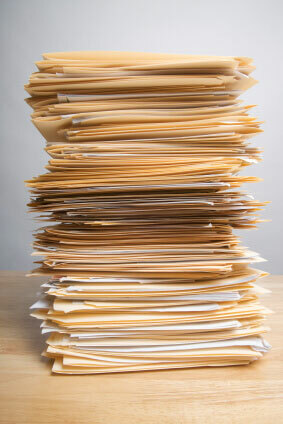 Let us take your stacks, or rooms of paper documents and start you on the road to the paperless office. You no longer need to rifle through a File Cabinet to Find the document you're looking for. Shoreline's paper scanning services will create high quality images from your paper documents and then provide access to this information from anywhere, at anytime. In many ways, Paper is one of the most polarizing ways to store and retrieve information. It's easy to use, cost effective, and widely available - it also doesn't require any electricity or special machinery to read it's contents. On the other hand, it is static, meaning that it's not easy to update or change, and it's inefficient to store, as it requires significantly more space than other types of information media. In addition, to find out more about how to pull all your content together, be sure to check out our solutions for accessing and retrieving your information using Document Management Software.